The first Design Ops Sprint Review took place on Sept. 27 where the team delivered a preview of the visual direction the application will be taking. This included a preliminary mockup of the landing page header and dashboard. The Design Ops team is applying universal design elements for building the component library and style guide that will be shared across all the digital services teams. This component library provides a holistic design approach yet allows each digital services team the flexibility to build, implement and test new functionality, iteratively. The goals of this first Sprint included conducting visual design studies to identify and adopt a consistent look and feel and an inventory of core components for what still needs to be completed. Based on the feedback we received, it was agreed to adopt the ‘professional’ template as the primary look and feel while also including elements that were both ‘warm’ and ‘confident’. Based on preliminary digital design study and a mockup of an intake screen role and were able to achieve consensus on a single design direction going forward. The ultimate goal being a look and feel that is completely accessible yet professional. The Child Welfare Digital Service (CWDS) is a groundbreaking collaborative, a mix of vendors and state technologists working together, using agile software development methods, with child welfare practice experts across the state. As a nonprofit social venture focused on improving outcomes for children and families, Case Commons is excited to join forces with the Technology Platform, DevOps, Policy, Data, Implementation and other CWDS teams to deliver the Intake Digital Service. Case Commons is deeply invested in the state's commitment to user-centered design. User-centered design puts caseworkers and supervisors at the heart of our work. Meeting compliance and reporting requirements is, of course, crucial; our starting point, however, is the flow of work and organization of information that best support day-to-day operational decision making. On past projects this user-centered approach has helped us measurably improve both practice fidelity and data quality. In Indiana, for example, we implemented, as key features of a new child welfare system, “embedded” operational metrics on caseworker dashboards; these metrics contributed to a 13.8% increase in the share of children seen by their caseworkers in the last 30 days, and an 81% increase in recorded visits between children and their birth parents. What sets our work with CWDS apart is that the state has arranged an unprecedented level of direct access to our users. We began with intensive discovery, interviewing and shadowing caseworkers and supervisors across our six core counties: Los Angeles, Ventura, Santa Cruz, Fresno, Yolo and Butte. We not only listened to county users to understand their pain points and aspirations, but also observed them as they did their jobs - in the office and out in the field - to see the problems they didn’t think to share with us because they've become so used to them. How are we able to reach out to and do testing with so many users? 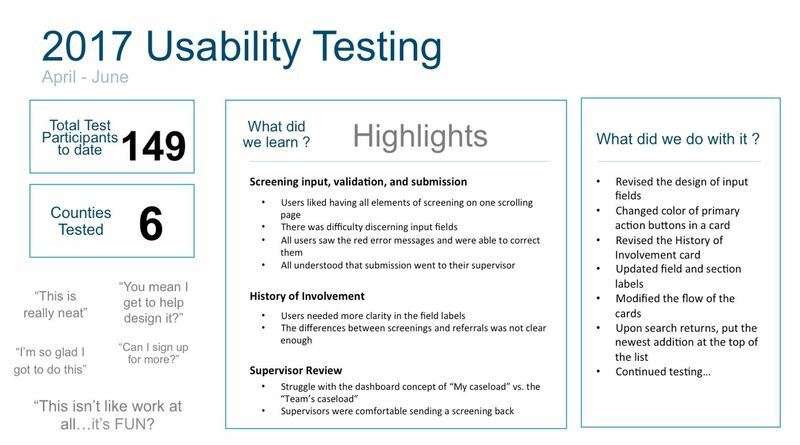 The answer brings us to the most exciting aspect of our approach to user-centered design: Our core county representatives (13, across 6 counties) not only coordinate site visits, but also, after a bit of training and practice, conduct the testing themselves! Because of their backgrounds in social work they are great listeners, exceptional testers and full partners in design thinking. They make sure caseworkers and supervisors stay right where they belong: at the heart of our work. 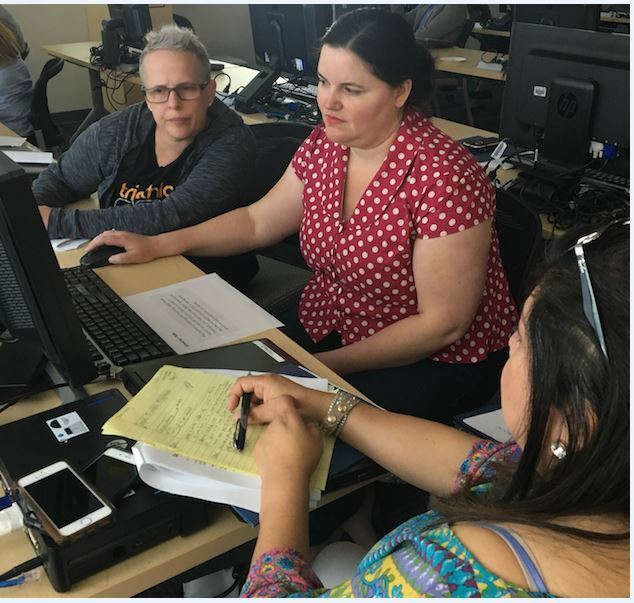 Case Commons https://www.casecommons.org is privileged to be part of CWDS, working in partnership with a mix of vendors to deliver an open source digital service for California’s child welfare system. Case Commons is a nonprofit social venture. We build user-centered software for human services. Our motto is “Helping the helpers.” Our mission is to promote best practice and improve outcomes for at-need children, families and populations.